Planning a wedding takes time and a great deal of patience. Your choice of wedding limo will say a lot about your personality and style and will no doubt leave a lasting impression on your guests. Here at Lavish Limousines, we’ve come up with some advice on what you should look for when selecting that perfect wedding limo for your special day. Limousines come in many different styles and are a great way of transporting large or small groups around. When you’re planning your wedding, consider the size of your bridal party and how you’d like them to be transported. Traditionally the bride would always arrive with her father. The mother-of-the bride with the bridesmaid, and the groom with his best man. But these days convention has fallen by the wayside. You may want to arrive in a group, have the pet dog in tow or even reserve a seat for your photographer so they can take some nice wide angled shots. In terms of vehicles, variants of the Chrysler 300C are most popular due to their blend of style and generous interior size. For weddings, people usually want a brilliant and pure white coloured car. Most limousines, for whatever reason, are a creamy shade of white or white with a black roof. 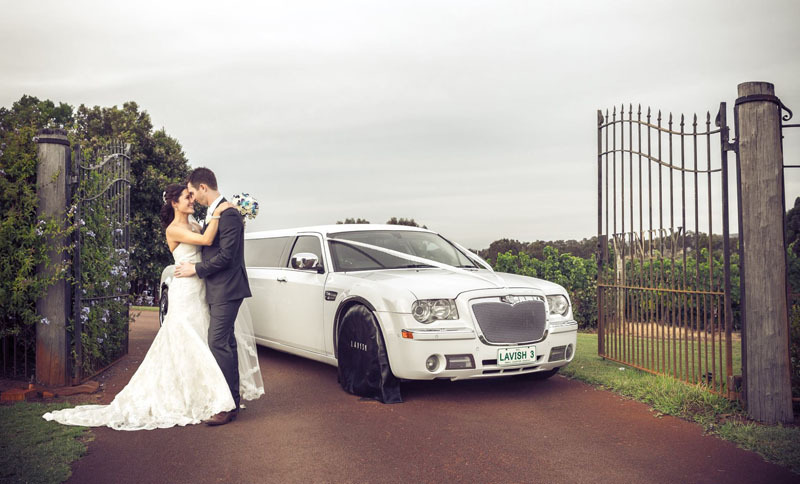 The Pure White Chrysler from Lavish Limousines, for example, is the only wedding appropriate white limousine in Perth. Such a pure white limousine rolling up to your venue on the wedding day looks stunning and the overall impression just isn’t the same with a different colour. On the wedding day, it’s all about the elegance. However, no matter what the bride wears, there is nothing elegant about struggling to get out of the rear door of a limousine, fumbling about with the bulk of the wedding dress. 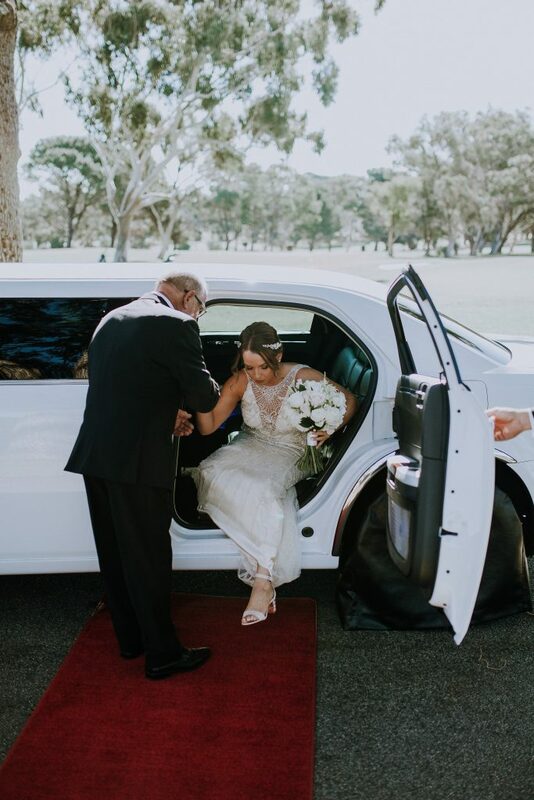 Vehicles from Lavish Limousines all feature rear opening bridal doors, making entry and exit to the limousine effortless and elegant for the bride. It’s vital to ensure that the wedding dress doesn’t have even a speck of dirt on it. This effort throughout the day to keep the dress pristine and white can all be undone by just one brush against a tyre that’s been freshly slickened with gloss. 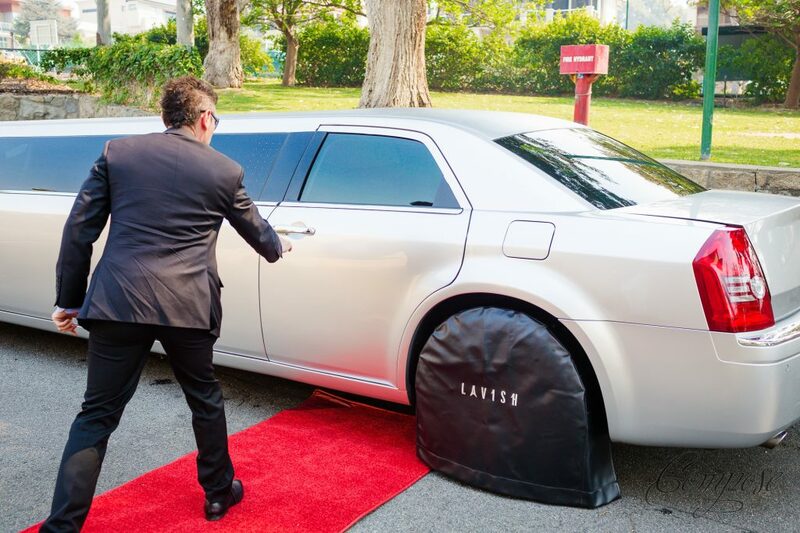 For this very reason, Lavish Limousine uses a tyre guard to ensure that even if the bride’s dress brushes or falls where the tyres is, the rear wheel cover shields contact. The red carpet not only ads that luxurious runway effect, but it’s yet another line of defence to keep that dress as pure white as it was in the store. Entries to churches and other popular venues often have dirt or gravel roads between the limousines’ closest access point and the entry of the venue. The red carpet ensures that the bride’s shoes and any parts of the dress that may trail or fall onto the ground is protected. Your chauffeur should be able to help you with any requests. Sometimes the bride and groom will want to visit somewhere en-route to the wedding, or go past a special landmark which has some significance to them. You can request for specific music to be played during the journey. All our chauffeurs are friendly, well presented, professional and experienced. Wedding limousines can come with extras. Most are decorated with ribbons with the colour of your choice, but they can also come with onboard refreshments. Lavish Limousines provide champagne and fluted glasses or bottled water for the bridal party as standard. All limousines are also fitted with internal lighting and surround-sound speakers and some have pearl bar tops and massage seats. For peace of mind and to ensure your day goes smoothly, investigate costs and timings ahead of making any booking. Find out what is included in the price, such as mileage and photography waiting time. Check that your car is available for as long as you need it and that you won’t be hit by any hidden extras if there are delays. 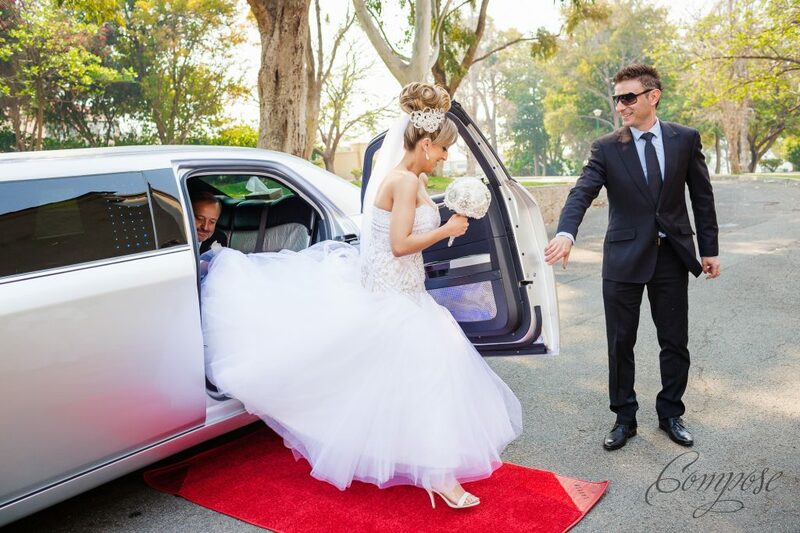 Be mindful that a bride dressed in a full wedding gown may take longer to get in and out of a limousine. At Lavish Limousines, we do a final confirmation call before the wedding date to go through all the details so the day goes perfect. 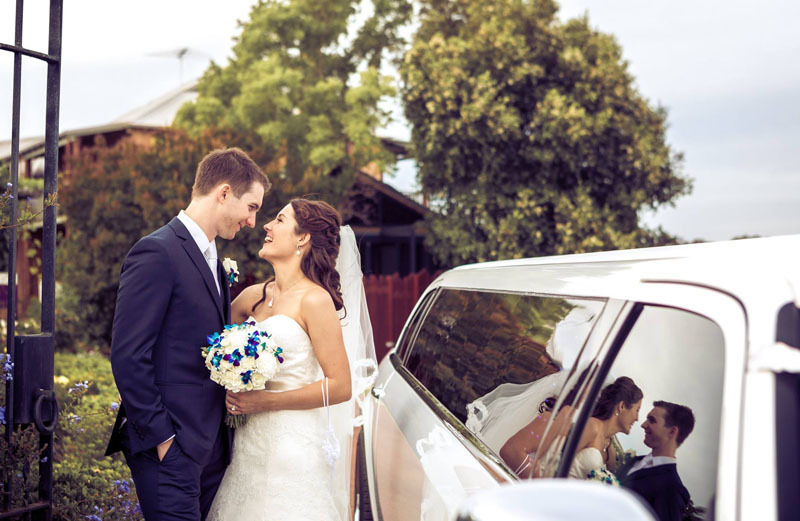 Whatever your requirements for your big day, Perth-based Lavish Limousines can help. We’ve been established twelve years and offer great attention to detail. Our limousines come with extras such as leather seats, televisions and state-of-the-art audio systems. What’s more our reviews rate us first class, so give us a call today to find out more.